Mesothelin (MSLN) is a tumor differentiation antigen present at low levels on a restricted set of normal adult tissues (e.g. mesothelium), and is expressed at high levels in mesotheliomas, as well as ovarian, pancreatic, and lung cancers. The MSLN gene encodes a 71 kDa precursor protein that is processed into two mature proteins: the N-terminal Megakaryocytic Potentiating Factor (MPF) and the C-terminal mature MSLN (mMSLN). MPF is a 31 kDa glycoprotein that is secreted from the cell into the blood. The mMSLN is a 40 kDa glycoprotein protein that remains bound to the cell membrane by phosphatidyl inositol. 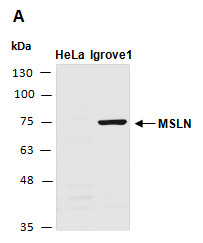 Rabbit polyclonal antibodies were produced by immunizing animals with a GST-fusion protein containing the N-terminal region of human MSLN protein. Antibodies were purified by affinity purification using immunogen. cancer cells, using anti-MSLN(N) (R3355-1) at RT for 2 h.